Today Antutu reveals our list of the global top 10 best performing Android phones for December 2018. What are the best Android phones on the market right now? Check out our most updated December ranking as measured by the average Antutu score. 1. Score: all the scores are averaged, not highest score per model (actual running results may fluctuate, which is a normal phenomenon). 2. Period of data collection: December 1, 2018 to December 31, 2018. 3. Data amount: at least 1000 units per model. According to our most updated Top 10 ranking, the HUAWEI Mate 20 siblings powered by Kirin 980 processor occupy the top three positions for the second consecutive month (though in slightly different orders). 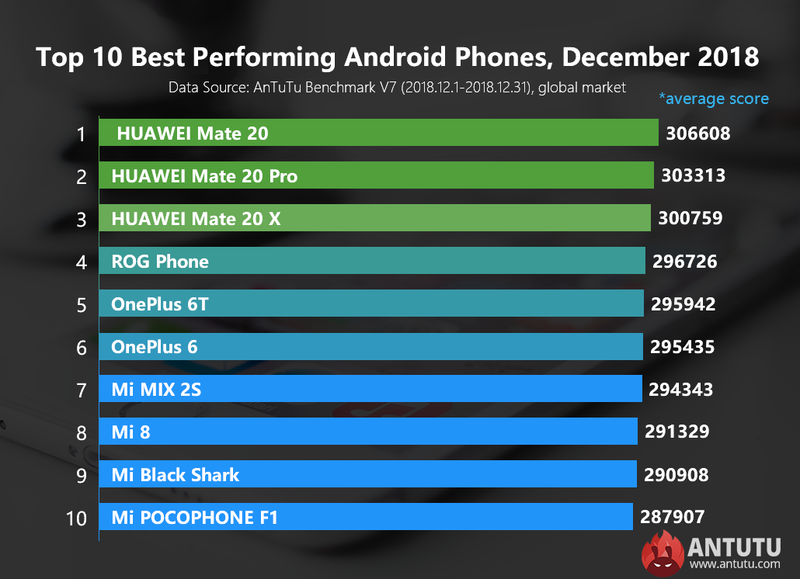 In particular, HUAWEI Mate 20 takes the first position with an average Antutu score of 306,608 points, followed closely by HUAWEI Mate 20 Pro and HUAWEI Mate 20 X with an average Antutu score of 303,313 and 300,759 points respectively. Rounding out the rest of the Top 10 are, in order, ROG Phone (No.4, 297,019), OnePLus 6T (No.5, 295,181), OnePlus 6 (No.6, 293,745), Xiaomi Mi Black Shark (No.7, 291,099), Xiaomi Mi 8（No.8, 287,142）, Xiaomi Mi MIX 2S (No.9, 297,111) and Meizu 16th (No.10, 286,943). Since all these models share the same Snapdragon 845 processor and all have flagship-level storage configuration, the score difference between them is marginal. In particular, the fourth-ranked ROG PHONE delivers the best performance among all the Snapdragon 845-powered smartphones as it is powered by a speed-binned Snapdragon 845. In the coming months, a number of smartphones powered by Snapdragon 855 are expected to be released. From the benchmark results we revealed earlier, Snapdragon 855 smartphones are expected to score over 350,000 points on Antutu benchmark. At that time, there is going to be a reshuffle in Antutu performance ranking. Let’s stay tuned. The above data reflects the changes of Android phone performance for December, 2018. For more information about the ranking list, please visit Antutu official website or download AnTuTu Benchmark and check in the menu of “Ranking”.